♥ Fall into Shawls ends tonight! If you want to be eligible for the prize drawing next week, please get your finished object into the contest thread before I lock it in the morning. ♥ My mother’s socks are off the needles! ♥ 2 Molly Hats by Erin Ruth have been finished as well! ♥ Margo Poncho by Elizabeth Smith is slowly growing. ♥ I could not resist starting a long-term spindle project during my knit dates. Two if by Hand SW BFL “Exhausted Pinks” on my micro Trindle. ♥ Woodland Sampler by Frosted Pumpkin Stitchery is complete! ♥ Picture This Plus Lugana evenweave for two FPS samplers next year! ♥ I revisited my goals from 2014 and found I didn’t do so well on most of them. I did have a good laugh rewatching Episode 53 to remember what they even were. 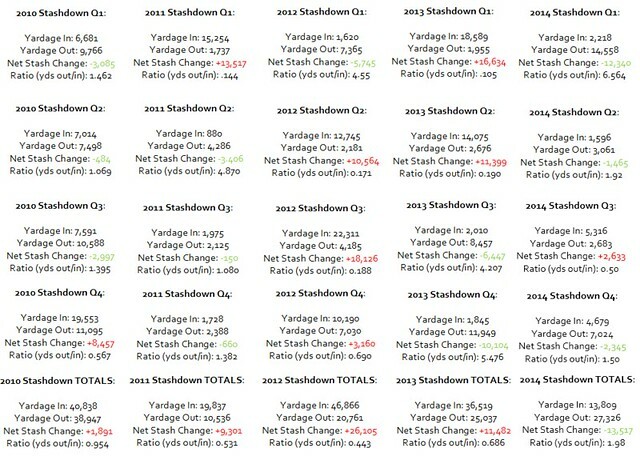 ♥ See my yardage tally post and Stashdown Q4 post to see how I fared in those endeavors! ♥ Handknit/Handspun Giftmas 2015 is a go! I’m going to work on presents throughout the year to get them all done before going home in December. I have 10 to work on for family, not including my household. ♥ I want to spin at least 144oz out of stash for an overall stash reduction of 32 ounces (or 2 lbs) of fiber from the amount I have today. There will be a blog post about this in the coming days. ♥ I’m hoping to knit at least 3 sweaters out of stash this year: my current WIP “Margo Poncho”, “Andover Poncho” with some lovely Pashmina worsted, and to resurrect my Hiro sweater and do an afterthought steek to make it a cardigan. ♥ I want to knit at least 6 pairs of socks and have put together a mini-sock club of 8 skeins to pull from for the year. ♥ Finally spin on both of my Turkish spindles. ♥ Sew 4 articles of wearable clothing from fabrics I have in-stash. I would like to have a mostly handmade wardrobe by 2020. ♥ Resist stashing fiber beyond my two clubs and yarn in any form for the year. Exceptions might be made in preparation for 2016’s Zombody Year Long sock club I would like to do for myself. Episode 98: Happy New Year! Today’s a pretty long one as I look back on 2014, talk about my plans for 2015, and show off the final finished objects of the year. Happy New Year, kittens! We made it, kittens! It’s the end of 2014 and the fifth consecutive year of Stashdown tracking! For the first time in five years, I ended in the green. AND I purchased less yarn this year than any of the four previous ones. It feels good to finally have a successful year. I’m hoping 2015 will be equally successful, but hopefully even more. There will be some changes to how I track next year, including dropping off the first 4 years of Stashdown numbers for the running analysis. The charts are becoming difficult to read with all of the quarterly information since 2010 on them. Also, watch for changes in how I will track my fiber stash! I’m thinking of making a blog post about it in the coming days. Kittens, it felt like I knit a lot more this month than I actually did. All of that yardage was very hard earned. I’m not unhappy at all with anything I knit to get those yards: a pair of socks for my mother, two hats, part of a poncho…all good projects that I’m happy with! No real show notes this week, kittens! Happy holidays! It’s a super short one today as my week was focused on sewing the Elsa doll and cross stitching. I hope you all have a wonderful holiday! ♥ Fall into Shawls has exactly two weeks remaining! Be sure to get pictures entered of your FOs to be eligible for prizes in the Ravelry group! ♥ I showed some of the pretties from my show, Lamby Toes, at the end of the show. I keep having issues getting better pictures of them.